I reckon this recipe is a saver for myself especially on hectic days. You can whip up the dish in just a few minutes without any fuss at all. 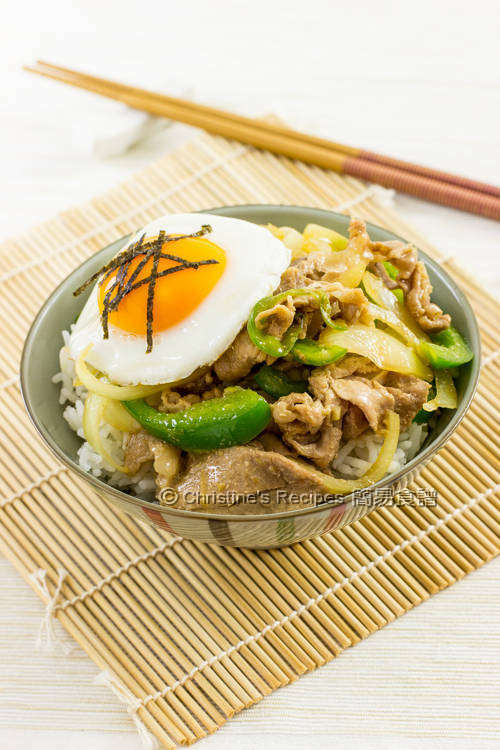 This simple rice dish is full of nutrients and flavours that your family will love. As for my hubby, the fried egg was the highlight. For myself, the sauce was what I’d exactly like to go with the steamed rice. You don’t need to worry anyone will overeat as it’s served in a bowl. Once you get all the ingredients ready. You only need a pan. Saute veggies, then cook the pork followed by adding the seasonings. No worries, I won't forget my husband's fried eggs. Heat oil in a pan over medium-high heat. Sauté onion until fragrant. Add garlic. Stir to combine. Add capsicum, then followed by the pork. Stir and cook till the surface turns white. Increase the heat. Pour in the seasonings and continue to cook until the sauce reduced by third. Set aside. In the meantime, use another little pan to fry two eggs to your liking. 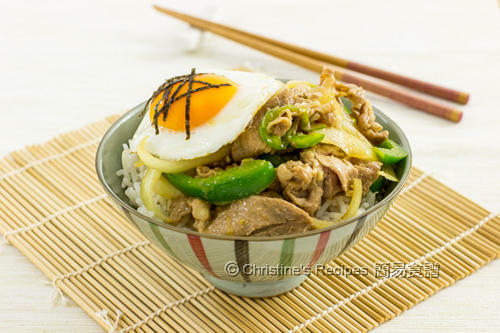 Serve the pork with sauce and eggs on top of two bowls of steamed rice. Sprinkle seaweed on top of the eggs. Enjoy ! This time I used the thinly sliced pork for shabu shabu (hot pot) sold at a Korean shop nearby. It’s very handy. 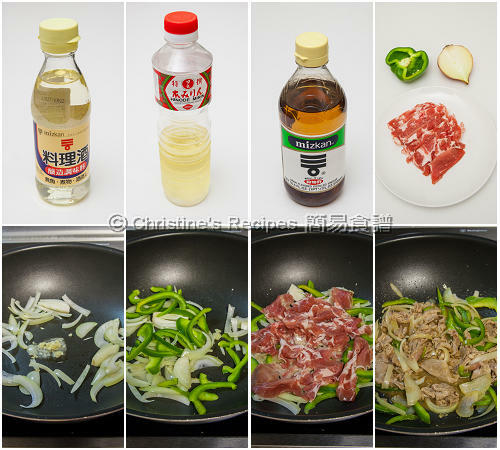 Or you can refer to the previous recipe of Japanese ginger pork to make your own thinly sliced pork, in method 3. That's a bowl of comfort and deliciousness, Christine. Yeah, this rice dish was a big hit in the family. We all loved the flavours. I think you'd like to try it.